Tel Megiddo (Hebrew: מגידו) is a hill in modern Israel near the Kibbutz of Megiddo, the site of the ancient city of Megiddo, and famous for several famous historical battles. It is located about 18 miles (29 km) southeast of the coastal city of Haifa in northern region of Israel. A rich archaeological site covering many levels of settlement, it is known alternatively as Tel Megiddo (Hebrew) and Tel al-Mutesellim (Arabic), the word tel meaning "hill." It comprises 26 layers of the ruins of ancient cities in a strategic location at the head of a pass through the Carmel Ridge, which overlooks the Valley of Jezreel from the west. In ancient times Megiddo was an important city-state of ancient Canaan and an important town in the later Kingdom of Israel. It was strategically located along a major trade route and was the site of three major battles in military history. Numerous significant archaeological finds have been discovered there since the early twentieth century. It is perhaps best known, however, as the location of the supposed future battle of Armageddon predicted in the New Testament Book of Revelation. 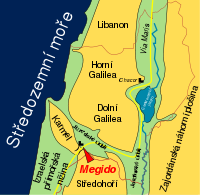 Map shows Megiddo's location at the base of the Carmel mountain range along the Via Maris. Megiddo was a site of great importance in the ancient world, as it guarded the western branch of a major pass along an ancient trade route which connected the lands of Egypt and Mesopotamia. In the Bible, this route was called Derekh HaYam (Hebrew: דרך הים), or "Way of the Sea." It became an important military artery of later armies, and during the period of the Roman Empire, the route was known as the Via Maris. 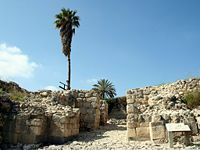 Megiddo also lay along the route that connected Jerusalem and the Jordan River valley with the important coastal trading cities of Phoenicia. 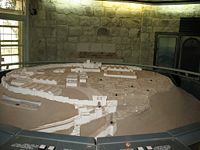 Excavations indicate that the city was site was inhabited by 7000 B.C.E. and an established settlement existed as early as 4000 B.C.E. Prior to Israelite settlement, Megiddo was an important town of ancient Canaan, overlooking the Valley of Jezreel, also known as the Plain of Esdraelon. After the Israelite conquest, the city was reportedly rebuilt and fortified by King Solomon. Structures thought to be stables were excavated at Megiddo in the twentieth century and initially dated to this Solomon's time, but the dating and even the function of these buildings as been challenged by more recent findings. The site was inhabited from 7000 B.C.E. to 500 B.C.E. Battle of Megiddo of 1478 B.C.E. : Fought between the armies of the Egyptian pharaoh Thutmose III and a large Canaanite coalition led by the rulers of Megiddo and Kadesh. This is the first documented battle in recorded history. The battle is described in detail in the hieroglyphics found on the walls of his temple in Upper Egypt. Battle of Megiddo of 609 B.C.E. : Fought between Egypt and the Kingdom of Judah, in which King Josiah, fell while opposing Neccho II. Josiah, hailed by the biblical writers as the greatest king since David, had ridden north from Jerusalem to head off an Egyptian force preparing to attack the Babylonian army. Battle of Megiddo of 1918 C.E. : Fought during World War I between Allied troops, led by General Edmund Allenby, and the defending Ottoman army. Megiddo is perhaps best known, however, as the site of a future battle prophesied in the New Testament Book of Revelation (see below). In addition to the above battles, a stele found at the site indicates that it may have been occupied by Sheshonk I (biblical Shishak) in the late tenth century B.C.E. Later, King Ahaziah of Judah died at Megiddo while fleeing from Jehu of Israel during the latter's coup against Ahaziah's ally Joram of Israel about 842 B.C.E. Hundreds of Phoenician ivories have been discovered at the site, showing its importance as a trading center linking both Egypt and the northeast, and the coastal cities with the interior of Israel and Judah. Although the site remained of strategic importance, the town of of Megiddo seems to have been abandoned around 450 B.C.E. Today, Megiddo is an important junction on the main road connecting the center of Israel with lower Galilee and the northern region. Thr modern Kibbutz of Megiddo is nearby, just a little less than 1 km away to the south. 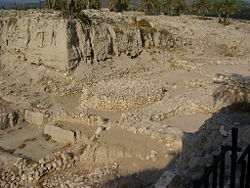 Megiddo has been excavated several times. The first excavations were carried out between 1903 and 1905, by Gottlieb Schumacher for the German Society for Oriental Research. In 1925, digging was resumed by Oriental Institute of the University of Chicago, financed by John D. Rockefeller, Jr. until the outbreak of the Second World War. During these excavation it was discovered that there were 20 levels of habitation, and many of the uncovered remains are preserved at the Rockefeller Museum in Jerusalem and the Oriental Institute of the University of Chicago. In the 1960's, Israel archaeologist Yigael Yadin conducted several smaller scale excavations. The site has most recently (since 1994) been the subject of biannual excavation campaigns conducted by The Megiddo Expedition of Tel Aviv University, directed by Israel Finkelstein and David Ussishkin, together with a consortium of international universities. At Megiddo two complexes originally thought to be stables were excavated from Stratum IVA, one in the north and one in the south. The southern complex contained five structures built around a lime paved courtyard. The buildings themselves were divided into three sections. Two long stone paved aisles were built adjacent to a main corridor paved with lime. The buildings were about 21 meters long by 11 meters wide. Separating the main corridor from outside aisles was a series of stone pillars. Holes were bored into many of these pillars, possibly so that horses could be tied to them. Also, the remains of stone structures thought to be mangers were found in the buildings. It was suggested that each side could hold 15 horses, giving each building an overall capacity of 30 horses. The buildings on the northern side of the city were similar in their construction, but with no central courtyard. If the complex was indeed a stable, then the capacity of the northern buildings was about 300 horses altogether. Both complexes could hold from 450-480 horses combined. The buildings were found during excavations between 1927 and 1934 at Megiddo. Head excavator, P.L.O. Guy, originally interpreted the buildings as stables and dated them to the time of King Solomon. Since then, his conclusions have been challenged by scholars such as James Pritchard, Ze'ev Herzog, and Yohanan Aharoni. 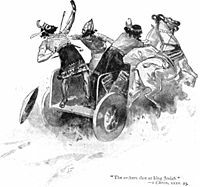 Noting that no items associated with horses, chariots or cavalry were found at the location, they suggest that the buildings should be interpreted as either storehouses, marketplaces, or barracks. Yigael Yadin and J. S. Holladay argue against this conclusion but date the construction to the time of King Ahab of Israel rather than Solomon. In 2005, Israeli archaeologist Yotam Tepper of Tel-Aviv University discovered the remains of a church, believed to be from the third or fourth century, a time when Christians were still persecuted by the Roman Empire. Among the finds is a large mosaic with a Greek inscription stating that the church is consecrated to "the God Jesus Christ." The mosaic is very well preserved and features geometrical figures and images of fish, an early Christian symbol. It is speculated that this may be the oldest remains of a church in the Holy Land.The remains were found within the grounds of a contemporary Israeli military prison. An inscription in the Megiddo church speaks of a Roman officer, "Gaianus," who donated "his own money" to have a mosaic made. Some authorities question an early dating for this site on the grounds that a Roman officer would not risk his career or even his life to build a church. On the other hand, persecution of Christians was sporadic in the Roman Empire during the early third century. Then I saw three evil spirits that looked like frogs; they came out of the mouth of the dragon, out of the mouth of the beast and out of the mouth of the false prophet. They are spirits of demons performing miraculous signs, and they go out to the kings of the whole world, to gather them for the battle on the great day of God Almighty… Then they gathered the kings together to the place that in Hebrew is called Armageddon (Rev. 16:14-16). The significance, timing, and participants in the Battle of Armageddon have been the subject of considerable speculation and debate throughout Christian history through the present day. ↑ Ekathimerini, Greek inscription in "oldest church." Retrieved October 29, 2008. ↑ New York Times, Israeli Prisoners Dig Their Way to Early Christianity. Retrieved November 24, 2008. Beit-Arieh, Itzhaq, Liora Freud, and Moshe Fischer. Two Fortresses in the Biblical Negev. Institute of Archaeology, 2008. ISBN 9789652660220. Cline, Eric H. The Battles of Armageddon: Megiddo and the Jezreel Valley from the Bronze Age to the Nuclear Age. Ann Arbor: The University of Michigan Press, 2000. ISBN 9780472097395. Davies, Graham I. Megiddo. Cambridge: Lutterworth Press, 1986. ISBN 9780802802477. Finkelstein, Israel, David Ussishkin, and Baruch Halpern. Megiddo IV: The 1998-2002 Seasons. Tel Aviv: Emery and Claire Yass Publications in Archaeology, 2006. OCLC 74716900. Harrison, Timothy, and Douglas L. Esse. Megiddo 3: Final Report of the Stratum Vi Excavations. Chicago, IL: Oriental Institute of the University of Chicago, 2004. ISBN 9781885923318. This page was last modified on 18 November 2015, at 15:40.